ZZAlpha LTD. does not handle client funds, does not provide individualized investment advice and does not buy or sell securities. ZZAlpha emails recommendations every trading day before the markets open. By your purchase of a subscription, you agree to the subscription agreement. Click to view. Each of the portfolios shown in the performance summary is available for subscription. The number of daily recommendations can scale between 2 and 20 or more, depending on the number of stocks in the segment. Both long and short recommendations are available. Please contact info@zzalpha.com for current pricing information. Retail investors often use more conservative options. Please contact info@zzalpha.com for pricing on other recommendation newsletters. NOTES: a)When both long and short recommendations are purchased for the same segment, the combined price is 175% of the single price. b) Renewal prices may vary from initial subscription price. c) Subscribers may cancel at any time. Cancellations in the first two months will be fully refunded. Later cancellations will receive refunds for the remaining months. d) Please inquire about exclusive state, national or world subscriptions. e) All subscriptions are subject to the terms of the subscription agreement. Many ZZAlpha stock recommendation portfolios have historic annualized returns over 15% - including the period of the 2008-2009 crash. 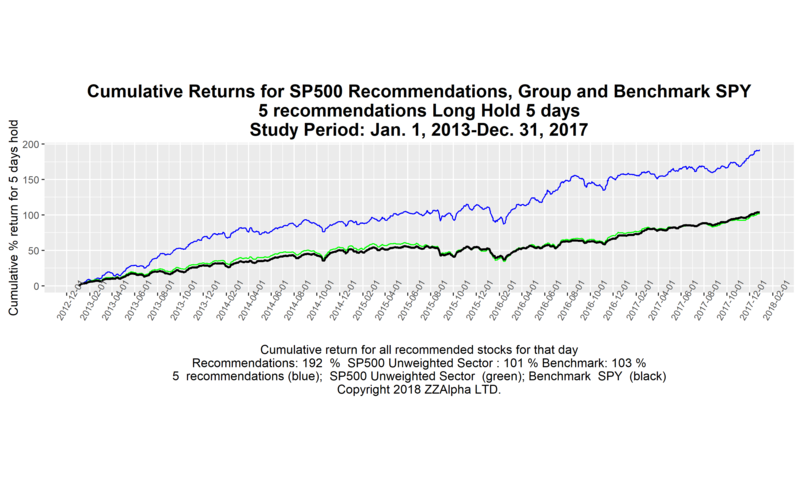 ZZAlpha recommendation portfolios can be used in long-short equity hedges to cut risk while beating benchmarks. Our unique, consistent machine learning technique makes those returns and their constrained risks possible. It re-learns the market's dynamics every night using over half a billion pieces of data. ZZAlpha dominates the field of effective machine learning for the US stock market. Don't expect colorful "stories" about the recommendations or brandishing of wild "predictions." 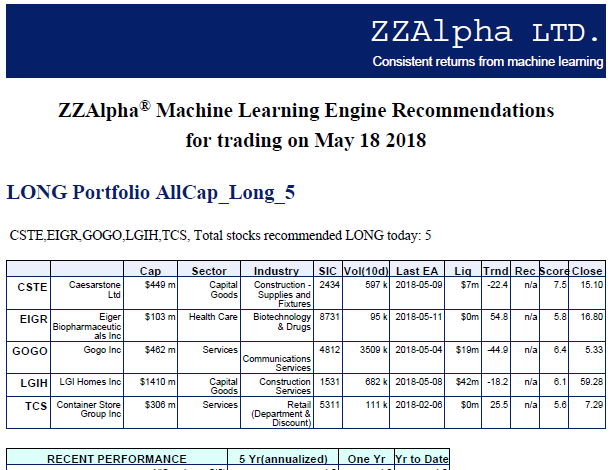 ZZAlpha provides recommendations from the scientific ZZAlpha machine learning technique accompanied by useful, brief objective descriptive information about the companies, as well as recent historical performance of the recommendation portfolio. Everything we do is data-driven. PAST PERFORMANCE does NOT indicate the probability of similar performance in future market conditions. Investment in equities involves SUBSTANTIAL RISK and has the potential for partial or complete LOSS of funds invested.